Trinity College Dublin researchers working together with University of Manchester’s National Graphene Institute (NGI) have found that mixing graphene with polysilicone (Silly Putty) produces incredibly sensitive pressure and strain sensors — they can even pick up on the footsteps of small spiders. Johnny Coleman investigates G-Putty with his son Oisin. Image credits AMBER, Trinity College Dublin. Graphene can be used to make some pretty sweet sensors. Previously, researchers from the Nanyang Technological University in China developed highly efficient light sensors using the stuff. 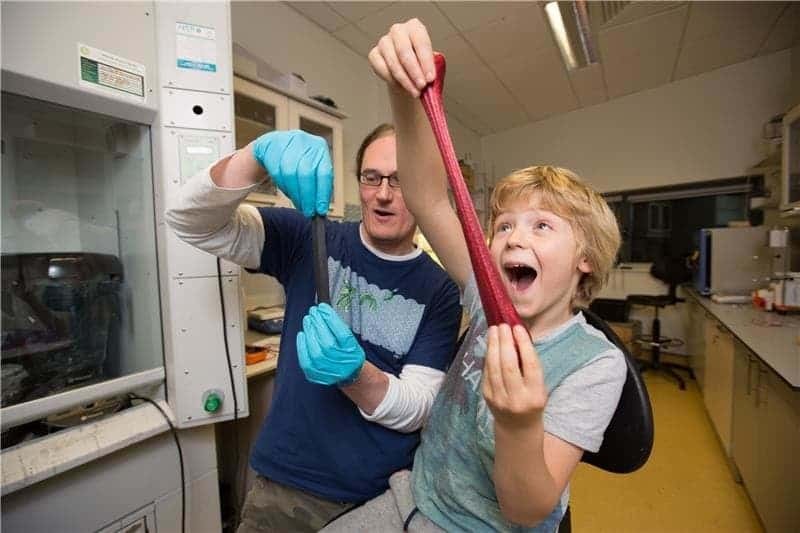 Now, Trinity’s School of Physics Professor Jonathan Coleman along with postdoctoral researcher Conor Boland found that putty mixed with graphene (which they call G-putty) has a surprising property: its electrical resistance is extremely sensitive to the slightest deformation or impact. The discovery could potentially open the way for inexpensive devices with a wide range of applications, such as diagnostics in healthcare. “What we are excited about is the unexpected behaviour we found when we added graphene to the polymer, a cross-linked polysilicone,” Coleman said. The two first tested the G-putty by placing it on the chest and neck of subjects, then using it to measure breathing, pulse, even blood pressure. The material proved to be hundreds of times more sensitive than current pressure and strain sensors. It can even pick up on impacts as light as a small spider’s footstep. Following initial development at Trinity, University of Manchester NGI scientists analyzed the material to determine its structure. From this, they developed a mathematical model of how G-putty deforms, explaining how the material’s structure dictates its mechanical and electrical properties. “These phenomena are associated with the mobility of the [graphene] nanosheets in the low-viscosity polymer matrix,” the paper reads. The full paper “Sensitive electromechanical sensors using viscoelastic graphene-polymer nanocomposites” has been published in the journal Science.